This is one of the only words in the English language that elicits a positive and negative response simultaneously in the human brain. The levels very, depending on the person’s point of view. To someone who is using a surrogate to start their own family, it could be the equivalent of winning the lottery. Killing two birds with one stone, if you will. Some of the best news they’ve had in years! To someone finding out for the first time they are carrying twins, it can also send up a red flag of a potentially high risk pregnancy. 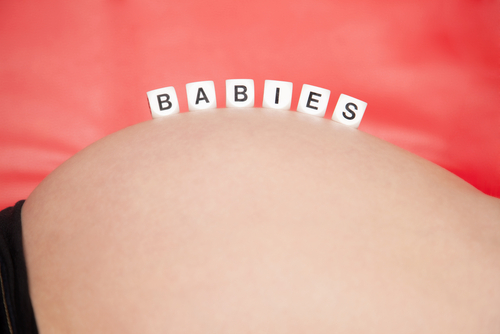 With twins come Complications such as: bed rest, premature delivery, fetal demise and others. A new father may become doe-eyed at first, then as the realizations of double the responsibility sink in, his eyes may then keep widening with nervous apprehension. To feel so excited and so scared all at once is a roller coaster of exhilaration. I can’t speak for other surrogates, but I do get the strong feeling that though most of us are generally excited about the concept of carrying twins, when the reality hits it’s a whole new ball game. My head races with all the complications that “could” happen and I start to freak out. My main panic attract came about by worrying the babies won’t be getting enough nourishment and they will come too early. That’s when I took to the old faithful social media and reached out to friends who were twins or have had twins. I discovered I wasn’t alone and that yes, my fears are justified, but there is absolutely no reason to freak out any more then with the other three pregnancies I’ve had. You see, our bodies are amazing things that can adapt to almost anything we throw at them. Well, we fortunate few who pregnancy comes easy to, can anyways and Doctors are very used to twin pregnancies and know what to expect and what to look out for from beginning to end. Now I really do believe I’m getting the easiest end of this deal. The parents are the ones who’ll have to deal with the midnight double feedings and diaper double-dutch. Which of course, they are more than happy to do :). I’ve been down similar roads before. This will be a new adventure for me. My IP put it best. “You’ve been pregnant before, we haven’t. This will be great because it’ll be new to both of us. Something we can experience as a first together.” They are on board and ready to dive in and that gives me the confidence to take the plunge too. Funny enough while putting my thoughts together for this blog I got a call from the lovely Ms. Ann at SAI wanting to share something she had heard on the news this morning: A mother in Ireland may have just beaten the world record for time apart delivering twins. Her first was born after her water broke at only 23 weeks and was born June 1st of last year weighing just 1lb 3oz. Bizarrely enough her contractions stopped after the first and the other’s fluid remained. Her second twin was able to stay in her womb until August 27th and weighted 5lbs 7oz at birth. A full 87 days later! Both twin girls are perfectly healthy now and doing very well. Stories like this just go to show that yes, we can worry and fret about unpredictable things in our future, but they also can turn out miraculously. I’m excited. I know the home these boys are going to is going to be so full of love that, in my bones, I can tell anything will be surmountable. Twins, wow, what a word!